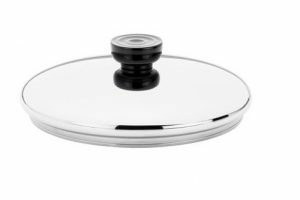 One of the most common questions we get is whether we carry replacement lids for such and such a size Revere Ware piece. We don’t carry any lids (just the knobs), and the official source for Revere Ware, World Kitchen, sells all of one of the traditional copper bottom lid sizes now. The solution is to tap into the robust marked for used Revere Ware lids on eBay. We’ve had an eBay helper site for Revere Ware cookware for a number of years now; it separates listings on eBay out by type and size, and is updated every 30 minutes. 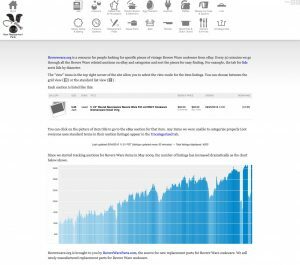 On the front page, we show a graph of the number of listings for Revere Ware items since 2009, which continues to grow; there is a very robust marketplace on eBay for just about anything Revere Ware. To find the right lid for your cookware, choose a size that is listed with measurements the same size or slightly smaller than the inside diameter of your cookware. Revere Ware lids are usually just slightly smaller than the cookware they fit. eBay listers will show this as anywhere from 1/16″ to 1/4 inch smaller than your cookware diameter. Very few Revere Ware pots in our experience have a diameter that is NOT a whole inch; exceptions we have found include a 6 1/4″ skillet (that takes a 6″ lid) and 5 1/2″ saucepans. However, based on auction listing we’ve seen, there do appear to be 6.5″ and 7.5″ sizes as well. For example, lids listed measuring 5.25 (5 1/4), 5.3125 (5 5/16), 5.375 (5 3/8), 5.4375 (5 7/16), and 5.5 (5 1/2) inches are all probably the same size measured slightly differently by different sellers and should all fit a sauce pot with a 5.5″ inside diameter. Which brings up another point – people typically ask, “do you have a lid for a 2 quart sauce pan.” That is a hard question to answer, given that Revere Ware altered the dimensions of their sauce pans and pots many times over the years. A 2 quart pot can come in one of several diameters. Use the instructions above to find the correct size. I am looking for the glass top for a small stove top coffee pot. The number on the part is A-31. Can you help? For a stove pot percolator, the best solution is the Fitz-All line of replacement glass percolator tops. We sell the large size, which fits any opening between 1.5 and 2.5 inches (and fits the Revere Ware stove top percolator quite well) but they also make a model that fits smaller openings. We have a beautiful 3 quart copper pot of yours with no lid. Will any of the other lids on your Ebay site fit this pot? Just to clarify, we aren’t the makers of Revere Ware cookware; we just sell replacement parts they no longer sell. Revere Ware lids come in many sizes. See the sizing suggestions above to measure your copper pot and see if you can find a lid that is shown as the same size or slightly smaller. I have a vintage set of Revere Ware pots and pans. Over time, the bakelite handles on some of the pan lids have fallen off. They are single screw lids but the screw doesn’t hold as the bakelite handle has disintegrated over time. How can I get replacement lids or handles? Please see our post on this phenomenon. If you see something the size of an eraser head where the knob attaches to the lid, it is the remains of the nut insert. Just grab it with a pair of pliers to expose the screw. You can then purchase a replacement lid knob from us. Thank you for explaining the eraser head nut! We’ve had the replacement knob for many years and couldn’t see how to attach it to lid. Got the pliers out and screwed it’s off. Now we can use the pot again ??? ?